The Bible contains sixty-six different books, written by forty different men, most of whom lived and died in different centuries, in different countries, many of them unaware of other prophets or other prophecies. The writers of the Bible were shepherds and kings, statesmen and beggars. All the Bible's writers were 'non-profit prophets' - being a prophet of God was not a sought-after job; most prophets lived miserably and died painfully. Most, like Jeremiah, tried to talk God out of hiring them. Yet with all of that, every book blends seamlessly into the rest, both the books that came before, and those that came AFTER. Some books of the Bible quote other books not yet written at that time. Others quote earlier prophets or sacred writing, but all are harmonious with one another. The writing of the Scripture is nothing short of miraculous in and of itself. Its preservation over the centuries is mind-boggling, if you let yourself think about it. You and I have both experienced discussions with non-believers convinced they can prove the Bible is wrong. They rail and babble and quote everybody EXCEPT the Scriptures, and in the end, come away as convinced as when they went in. Or get mad and just go away. Think how many times similar conversations take place around the world, every single day. Then, take a look at the broader view: In every generation since its compilation, the Bible has been the subject of discussion between believers and non-believers. In every generation, non-believers have made it their mission in life to disprove the Scriptures. Any discrepancy has been analyzed and re-analyzed by both friend and foe, read and re-read, argued and re-argued, in a million conversations over thousands of years. Whoever successfully proved the Bible wrong on any point; doctrine, history, archeology, law, medicine, science, or geography would have single-handedly destroyed the basic foundation of the Judeo-Christian ethic. A Book that claims to contain perfect knowledge and perfect accuracy sets a very high bar for itself. A Book that maintains that standard of knowledge and accuracy over the course of centuries - while under constant attack! - fair-minded logic demands it be accepted as perfect until proven otherwise. It requires willful suspension of reality to argue otherwise under such circumstances. The Bible is wholly consistent with known science. The book of Isaiah said the earth was round tens of centuries before Columbus. Ecclesiates 1:6 reveals that the winds move in cyclonic patterns and Job tells us that light is in motion (Job 38:19-20) thousands of years before weather satellites and Einstein's calculations proved both to be true. Medically, the Bible tells us the chemical nature of human life (Genesis 2:7, 3:19) that the life of creatures are in the blood (Leviticus 17:11), the nature of infectious diseases (Leviticus 13:46) and the importance of sanitation to health (Numbers 19, Deuteronomy 23:12-13, Leviticus 7-9) many thousands of years before doctors were still practicing blood-letting as a treatment for disease. The list goes on. Every historical event described by the Bible has either been confirmed by other sources, or has yet to be confirmed. Not a single historical event described by Scripture has ever conclusively been disproved. Sometimes, it is necessary to go back and take another look at the Source and meditate on just what a miracle it is in order to get a clearer understanding of what it says. It helps to reconfirm that everything it says is true. Despite thousands of years of editorial criticism, the Bible stands essentially unchanged from when it was first given. 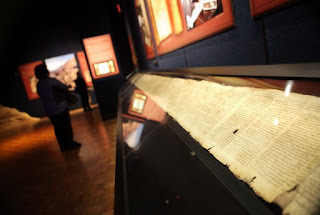 A complete copy of the Book of Isaiah was unearthed as part of the Dead Sea Scroll treasures and is today enshrined in the Dome of the Tablets in Jerusalem. I have personally seen it and marveled at the fact its date could NOT be questioned. It could NOT be younger than the day it was buried in AD 70. But, apart from grammatical changes made necessary by changes in Hebrew grammar over the centuries, it reads exactly the same way as the Book of Isaiah in your own Bible. It makes sense to assume the rest of the Scriptures are equally accurate, since there is no evidence to the contrary and all the available evidence supports Scripture. The Bible's accuracy is not limited to history, geography, science or medicine. It is equally accurate in describing the events that have not yet taken place. The prophecies of the Bible are, from God's perspective, ALREADY history. So not only does the God of the Bible know all things, but He has chosen to make known to us, through the Bible, what is still to come! In fact, even more than that, the God of the Bible CHALLENGES any so-called 'gods' to do the same. From God's perspective, outside of space and time, everything is now, so to speak. God's historical pronouncements are given from the benefit of Divine Hindsight. His prophetic pronouncements also enjoy the benefit of Divine Hindsight. The Bible describes the future, but to God, it has already happened, if you can follow that line of reasoning for a minute. Since to God, it already happened, the events that remain yet future will be fulfilled as specifically as those events that have already come to pass.